A rugged, attractive, and versatile RAID box that's equally at home in a mixed Mac/PC office, the field, or the trunk of your car. 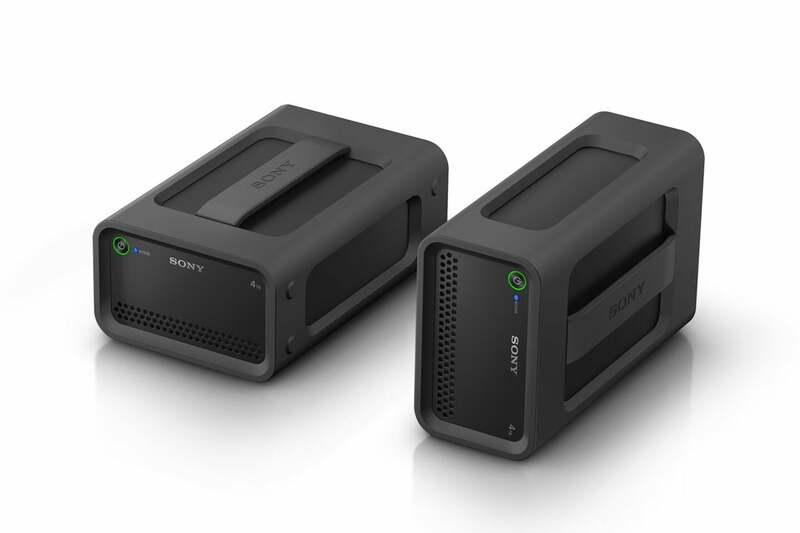 Designed with on-location video production in mind, Sony’s PSZ-RA4T Professional RAID is not the fastest RAID box we’ve tested, but it’s certainly fast enough. Made for travel, the PSZ-RA4T is thoroughly ruggedized and especially easy on the eye. Add the ability of this dual-drive unit to function via Thunderbolt 2 or USB 3.1 on your cohort’s or client’s Windows machine as well as your Mac, and you’ve got a winner. The PSZ-RA4T has enough deft design flourishes that leave no doubt that folks that work with such products supplied more than a little input. Or there’s simply an especially brilliant and practical designer at Sony. Kudos to the company, whatever the scenario. The silicon jacket surrounding most of the PSZ-RA4T is the most salient evidence of this. It’s considerably softer than the rubber you’ll find on some “ruggedized” hard drives—softer absorbs shocks better, so that’s a good thing. The jacket can be removed and the case opened for drive replacement. The front of the PSZ-RA4T has an attractive but not overly distracting green-ringed power button and blue activity light. With this drive being used in photo or video studios, not being a distraction is good. The cleverly-integrated handle is made of the same soft silicon as the jacket, and is extremely comfortable and offers a better-than-average grip. There’s no denying that the Sony PSZ-RA4T is a looker. It also has feet on the bottom and one side so shock absorption is the same in either orientation. The back of the PSZ-RA4T sports two Thunderbolt 2 ports, as well as a USB 3.x type B connector. There’s a RAID select (0/striped, 1/mirrored, JBOD) button and well as commit/confirm button that will switch RAID modes (note that switching modes will erase data). If you want to use the PSZ-RA4T with a computer that sports Thunderbolt 3, you’ll need an adapter. I recommend Apple’s Thunderbolt 3 (USB-C) to Thunderbolt 2 Adapter, as it can also be used to attach Thunderbolt 3 devices to older Thunderbolt 1/2 ports. Some don’t allow the this newer-to-older compatibility. The drive also has RAID mode lights, duplicate power and activity lights (another nice touch), and of course an AC jack. The latter warrants praise as it features a very snug and weather-resistant fit. Not waterproof but less prone to shorting from the odd sprinkle. Sony really didn’t miss a trick. The PSZ-RA4T arrives formatted in a striped RAID 0 array for maximum performance, which is roughly twice what you’ll see in mirrored RAID 1. It’s quite likely you will want to use RAID 0 for the performance, especially if you work with modern 4K and 8K video. Just be aware that RAID 0 offers no redundancy and suffers two failure points. Keep the drive backed up. The back of the PSZ-RA4t duplicates the front lights, adds the RAID indicator light and a very tightly sealed AC jack and plug. Then of course there are the Thunderbolt 2 and USB 3.1 5Gbps ports. With hard drives now available in up to 14TB capacities these days, it’s a little surprising that the PSZ-RAxx tops out at “only” 12TB (two 6TB drives striped in RAID 0). More modern and capacious hard drives such as Seagate’s 14TB IronWolf Pro and WD’s 12TB Gold are faster, so the unit might grab better scores in terms of sustained throughput, not to mention providing up to 28TB of capacity. As it is, on Amazon the 4TB PSZ-RA4T was listed for $379, the 6TB PSZ-RA6T for $452, the 8TB PSZ-RA8T for $600, and the 12TB PSZ-RA12T for just over $700. The means, as with all things in the Apple universe, you’re actually paying more than you should for the upgrade, albeit relatively little in this case. My only true complaint about the PSZ-RAxx is the run-of-the mill, three-year warranty. You’re paying a premium for this enclosure and it says “Professional” in the title. A five-year warranty would be more appropriate. The PSZ-RA4T’s performance was pretty much on target across both Thunderbolt 2 and USB 3.1 Gen 1 buses, falling just short of Sony’s claimed 440MBps over the former and registering over 300MBps on the latter. 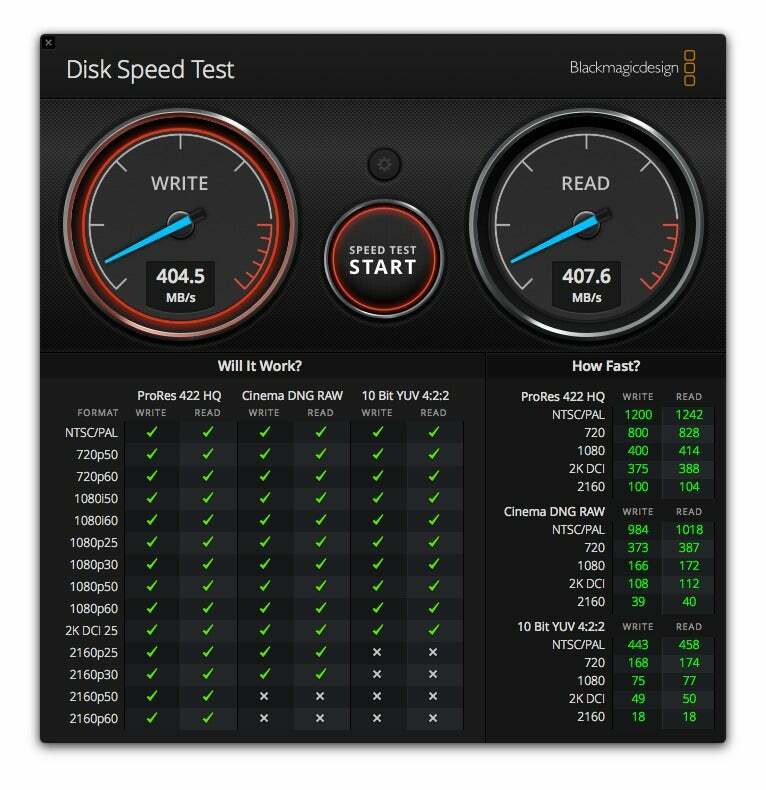 Note that the Blackmagic Design Disk Speed numbers shown below are from a late 2012 iMac with a Core i7-3770. With a newer Mac, you’ll likely see the 440MBps Sony claims. This is only partially indicative of the PSZ-RA4T’s performance. It was tested on an older Core i7-3770 iMac. With a newer Mac, it might be faster. With a Thunderbolt 3 adapter, though, it would be about the same. I also tested the PSZ-RA4T on PCWorld’s storage test bed. For some reason CrystalDiskMark 6 did not like the PSZ-RA4T over the USB 3.1 Gen 1 bus, rating the drive’s speed at around 150MBps in a straight sequential 32GB read/write. As this wasn’t born out by our real world copy tests over USB, I chalked it up to an incompatibility or bug, and left those numbers out. 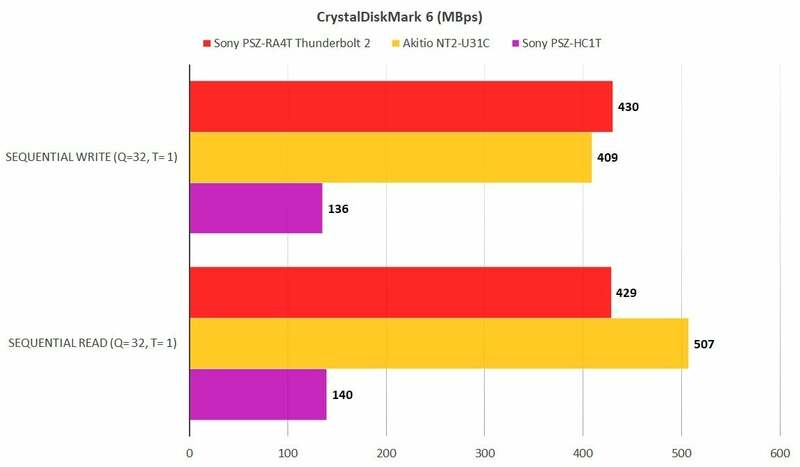 CrystalDiskMark indeed rated the PSZ-RA4T at over 400MBps—using Thunderbolt 2. Longer bars are better. 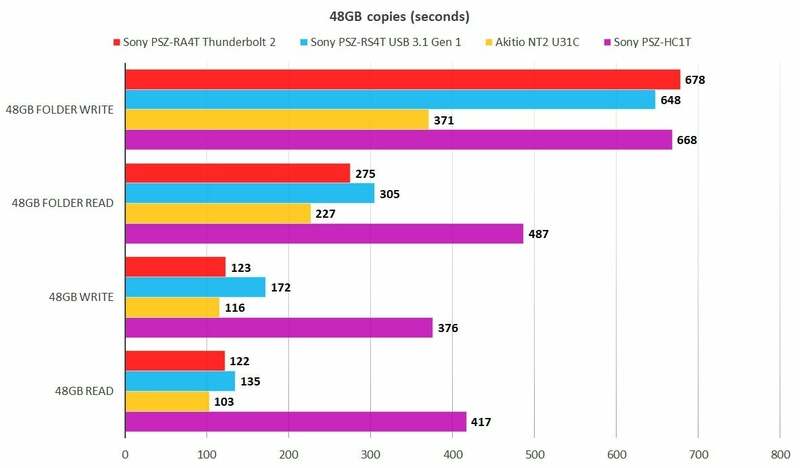 AS SSD’s sustained throughput numbers are often considerably higher than CrystalDiskMark’s, so these results are no surprise. Note that the PCWorld test bed runs on a sixth generation Core i7, rather than the fourth-gen that the Disk Speed test was run on. 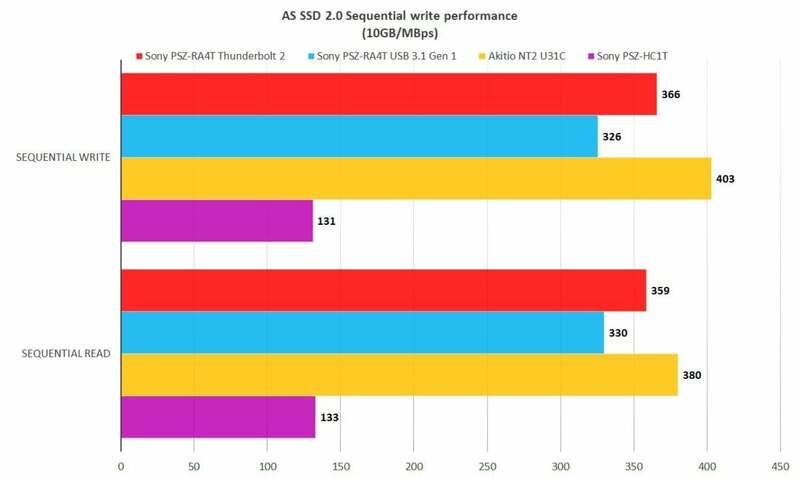 According to AS SSD, the Sony PSZ-RA4T’s throughput lands right where it should—for the most part. It’s only bested by the Akitio NT2 U31C which had two very fast 14TB Seagate hard drives striped in RAID 0. 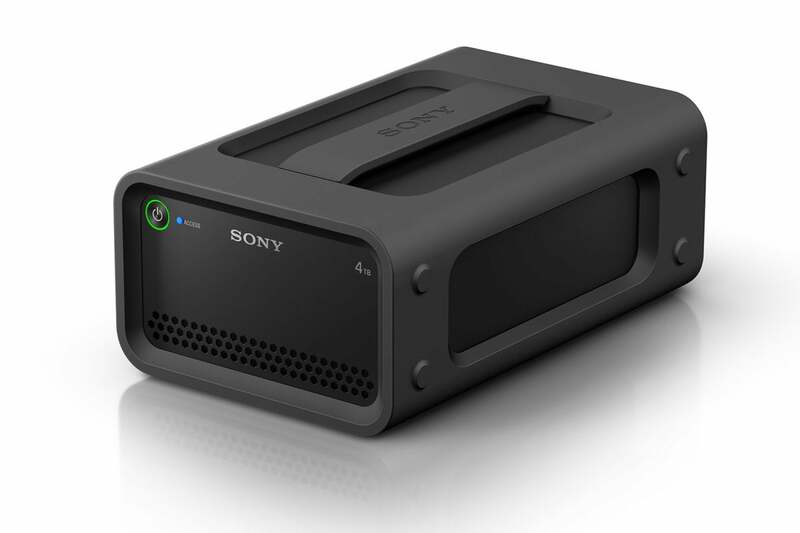 The other Sony is a single hard drive unit. Longer bars are better. In our 48GB copy tests, the PSZ-RA4T proved very facile with large files—not so much with smaller ones. However, the latter was almost entirely due to the fact that the PSZ-RA4T ships formatted to exFAT and the Akitio NT2-U31C was formatted to NTFS. Small file write performance is a known weakness of the exFAT file system, however, as it’s also the only format that’s natively compatible across all platforms, and the PSZ-RA4T is likely to be used that way, I tested it as it shipped. The NT2-U31C being rigged with two very fast 14TB Seagate IronWolf/BarraCuda Pro drives, didn’t hurt its cause either. Those drives are each capable of 250MBps transfer speeds. The PSZRA4T and the other Sony drive didn’t do particularly well with the 48GB set of files and folders, though it was ace with the single large 48GB file. Longer bars are better. In the end, the PSZRA4T is easily fast enough for most purposes, assuming you use it via Thunderbolt 2. It’s quick over USB, but perhaps not quick enough for capturing some of the high definition, high bit depth video formats used these days. Note that if you’d rather use APFS, HFS or NTFS, Paragon Software makes drivers that allow you to read and write these systems on either macOS or Windows. They’ve proven 100 percent reliable in my use and suffer little to no degradation in performance. Whatever Sony PSZRA4T’s lacks in performance—which isn’t much—is more than made up for by clever, rugged, and attractive design. 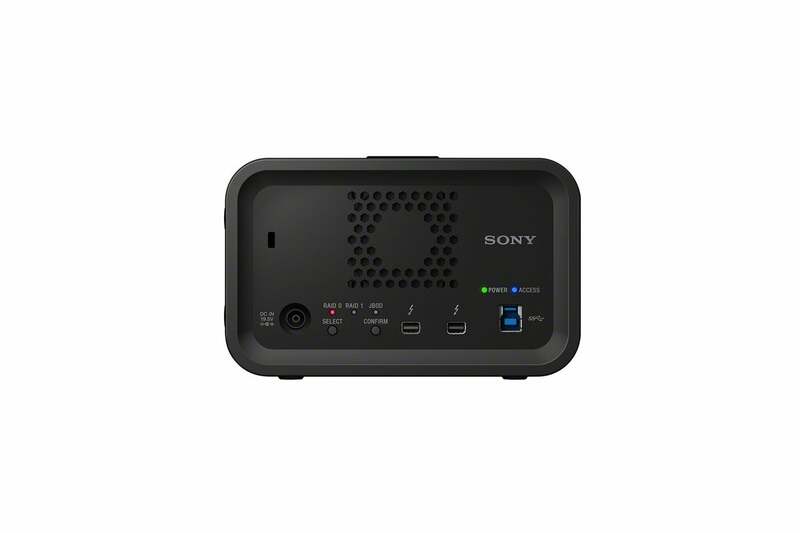 I’d like to see more capacious models and a five-year warranty, but this is still a very attractive product from Sony that I have no qualms recommending. Sometimes it's the little things like dual Thunderbolt 1/2 and USB connectivity; a ruggedized interior and exterior; and attractive design that make the difference. That's the PSZRA4T in a nutshell. It's certainly not the fastest dual-drive RAID enclosure we've seen, but it's fast enough and the extras make up for the premium price.